Junk food is junk by its very definition. But how bad is it and what is it that companies do not tell people about this food? This is what the Centre for Science and Environment (CSE) laboratory checked. The results were both predictable and alarming. What was equally predictable was the response of big food companies and their spokespersons—denials and dismissals. But they are missing the point. First the study: CSE tested all that is readily available in fast food outlets or as branded and packaged items in shops across the country. These ranged from instant noodles, chips and Indian bhujia to the ubiquitous colas, chicken fries and burgers. Finally, an article that will get the point across through the thick skulls of the indifferent parents and youth. The culture of celebrating through food is pervasive across all countries. When you couple this with the culture of consumption, where we feel satisfied only after buying a trolley-load of packaged and processed items and down tub-sized ice-creams and chips, it just spells doom for us. Up till the late 80s, Indian snacks were suffice for a party or get-together, now no birthday is complete for a child without a mandatory bash at McD's or Pizza Hut. Don't parents care about how the child will grow up and what values of consumption he / she will pass on to their kids? This whole posturing about feeding kids chocolates and chips because 'oh, they are small, let them enjoy' needs to be snipped from the bud. One in four of Americans are obese and Indians are right on track to beat that record! Sunita Narainji, while we appreciate your attempts to highlight numerous issues which affect our daily lives, I am happy to learn, if any of your efforts so far has borne any result ? Which Govt agency has paid heed to your organisation's advice ? "Therefore, Indian food regulations have to be even more stringent in limiting quantities of salt, sugar and fat in food." How on earth do you expect the govt to listen to you ? Good article. Is it possible to publish the analysis data in the form of a table that we can use as a ready reckoner? Is there any I.S. Code or any prescribed code in India that controls, mandates info and monitors quality of food products? I do value the hard facts you have presented about the covert presence of transfats in a number of popular prepackaged processed food products sold in the market. By doing so, you have educated a lot of people of the falacies embedded in the so-called statutory compliance of food safety standards by manufacturers. However, I find your approach rather lop-sided, as I do not find you equally concerned about potential health hazards of the 'tiffin', roadside food and sweets commonly eaten by hundreds of millions of Indians - from puri-kachori, to vada-pao, gulab jamun, etc. All of these are cooked in hydrogenated vegetable oil. Since these are not packaged food products and produced and sold by the unorganised industry, do not come under the purview of the food safety regulations cited by you. Are the health and safety concerns of only those who can afford to buy Lay's or McDonald's, important to the regulators as well as to Down to Earth? Let me first thank you for this excellent finding . Forget the loose government, but people should be assured that atlease we have some research companies like CSE, which are still alive in its true sense. I was really surprised to see such backstabbing done on the trust of the consumers by Big Brands like Pepsi, Haldiram, which surprisingly are the brands at the mercy of these consumer' trust and the so called quality they deliver as compared to the non brands. Its strange and annoying to realise the fact that now even there is no authnticity left for " Standards". Guess its the time now to set new STANDARD for a standard. The road side junk food and the laarri walaas too are considered to be junk, but then they atleast do not claim to be clean. They know, that they exist along with the fact that people know its a JUNK street side food, so we can never think to sue them for a food poisoning or for the health hazards. But to sell Anti health food under the TAG of healthy, is a CRIME and they must be really banned for the misinformation they are portraying. Thank you very much for bringing this issues of Junk Food where every kids and parent are opting for it without thinking its ingredients and excess of salt, fat and so on. Hope this article will open the eyes of the regulators and standards making bodies to regulate and monitor the junk food. Similar and even worse situation with the product quality and its ingredients is here in Nepalese market is available which goes without even notice and companies are making their business at the cost of our children and family health. It should be stopped and well regulated. Moreover it is up to us as a consumer to make healthier choice will be the strongest driving force behind all these miss happening to protect ourselves. I appreciate the efforts that you are taking in making us aware about the modern food habits and their pitfalls. I am a teacher who runs a science club. I am also very worried about the present trend among youngsters. As such it will be of great help if you can send me some of the tests that we can perform before the children. In anticipation of a positive response at the earliest. Good article! really eye opener.. But do we have an alternative? its all over the market, shops & stores. Chips for example are consumed as mandatory snacks, bhujia & peanuts also. people and children living in their homes with their family can keep a check but what about people living outside & alone, these snacks and chips have become their staple diet. fast food joints are big hit among youth n children.. what can we do to avoid it?! Thank you for a very timely piece. I have been having frequent tummy upsets recently and have tried to determine what could be the problem. I finally decided that it could be a food item (pretty cardboard box and polythene wrap) I purchased at the supermarket. Just a couple of hours ago, I telephoned a reputable testing agency and asked if they could give me their verdict. They said they could but it would cost me over 10,000 Sri Lankan rupees (depending on how many parameters I wanted tested). How many people can routinely pay these kinds of charges? I will just discard what remains in my larder and switch to another brand. The company concerned will continue on its merry way. Another point. I was on a group outing a little while ago. When the bus stopped, some of the group wanted to buy some food being fried by a roadside vendor. One of the group said it looked unclean but was told that it was safe 'because it was being cooked'. Even educated people sometimes think that cooking make food clean. An eye opening study.let us bring this to the notice of public & government. it is rewarding to have such an article. i believe we even have to go a step further, in legal regulation of these products. some suggestions might be penalize them heavily, cancel their licenses, pay hefty compensation, etc. only then will a deterrent be set. further we need to educate our children about the harms of junk food and to completely shun it. "Clearly, food companies are not in the business of food, but in the business of profit." They can make profit even by selling poison. I must congratulate you for the good work CSE is doing. With time more people will become conscious and things will improve. I wish to congratulate you on a very well written and most timely article. Please see the article on this link http://www.cmaj.ca/content/early/2012/04/16/cmaj.111895 which may be of interest. Parents do not have information on how harmful junk food is. Unlike in the US, most Indians still east home cooked food like dal and chapatti. I can't see junk food completely replacing our traditional food. 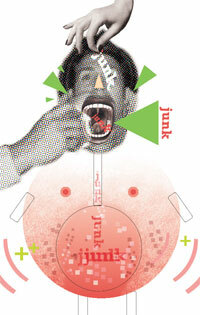 However, the information on the dangers due to junk food are getting across. Very intresting article, thank you for bringing this up.